Blessed Nativity Fast to you all! We are excited to begin preparing for our annual Christmas Eve Pageant. This year we will be performing the Christmas program The Friendly Beasts which is a combination of narration, a few small speaking parts, and carols in both English and Greek. 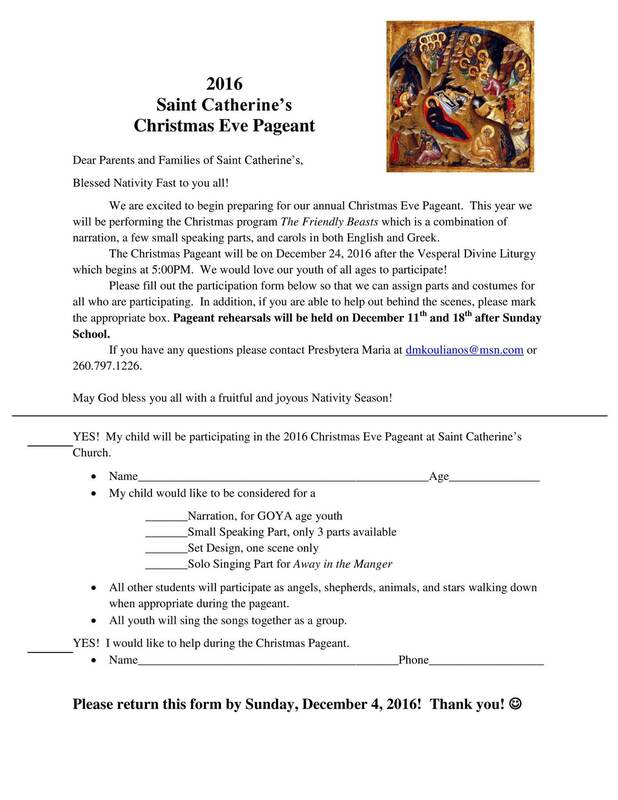 The Christmas Pageant will be on December 24, 2016 after the Vesperal Divine Liturgy which begins at 5:00PM. We would love our youth of all ages to participate! Please fill out the participation form below so that we can assign parts and costumes for all who are participating. In addition, if you are able to help out behind the scenes, please mark the appropriate box. Pageant rehearsals will be held on December 11th and 18th after Sunday School. If you have any questions please contact Presbytera Maria at [email protected] or 260.797.1226. May God bless you all with a fruitful and joyous Nativity Season! Click on the pic and follow the directions.